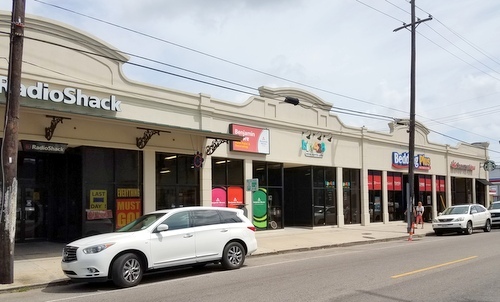 Chipotle fans tired of driving to Metairie may soon have a much closer option in Uptown New Orleans — with 2,250 locations nationwide, the chain is seeking to open its first storefront in New Orleans on Magazine Street in the Garden District next year. Chipotle Mexican Grill is hoping to open in early 2018 in the recently-closed Radioshack location in the same building at 2801 Magazine that houses Starbucks, said Cheryl L. Heidorn, the design manager for the Colorado-based business, in a brief interview Tuesday morning. After meeting with Councilwoman LaToya Cantrell and the Garden District and Irish Channel neighborhood groups, Chipotle is seeking to be classified as a “standard restaurant” rather than a fast-food establishment, Heidorn said. Any change of use in that location will require a Conditional Use from the City Council, Heidorn said, but the neighbors felt that a “standard restaurant” classification will fit the location better than fast food. The classification also has bearing on the business’s ability to acquire a liquor license, and while Heidorn said she is unsure whether this location will sell alcohol, some Chipotle location do serve a limited selection margaritas and local beers. Alcohol is a only a small part of the restaurant’s business model, Heidorn noted, comprising 1 percent or less of the company’s sales, and is more meant to compliment the menu of burritos and chips, she said. “It’s not a huge driver of sales for us, but it is a nice offering,” Heidorn said. Although permanent menu boards are a feature of fast-food restaurants, those at Chipotle change seasonally, and thus should not be considered “permanent,” Heidorn writes. The building design is not uniform, but was specifically designed for the location with a recessed patio, a “smaller quaint dining area” and signage that includes “halo illumination” at the request of Garden District neighbors. The hot sauce is at the tables, not a a self-service condiment bar. “As the largest purchaser of Tabasco in the world, we will be proudly displaying these bottles on the tables within our restaurant, not at a condiment bar,” the letter states. Trash cans are available to anyone who wants to bus their own tables, but it is not considered self-service either because employees will bus tables also. There is no drive-through, and the food is not prepackaged, Heidorn insists. While Heidorn concludes her arguments demonstrate that the Garden District Chipotle meets only one of the “fast food criteria” and thus should be considered a standard restaurant for zoning purposes, the city planning department’s note on it says it meets at least three of them — “and therefore is a fast food restaurant.” The city planning documents do not set a meeting date for the beginning of the conditional use process. While Chipotle has several locations in suburban areas around New Orleans, this will be the company’s first location in the city of New Orleans. It’s a fast food restaurant. Yuck! If it does open it won’t take long for to close and move to metairie! Anyone who has eaten at one knows it IS a fast food restaurant and not that good as Mexican cuisine goes. Our local Food Trucks serve better. Besides does anyone in New Orleans think Chipotle meets the “standard” that our local restaurants provide. This is the same strip mall that couldn’t support a Quiznos Sub fastfood chain. If Chipotle has a lick of sense they will scrap their plans before opening. Both NOLA, Uptown, and the entire Magazine corridor have zip desire for fast food.